Ecosocialists in Saskatoon have organized and set up a website. Visit http://www.ecoleftsask.ca for more information. 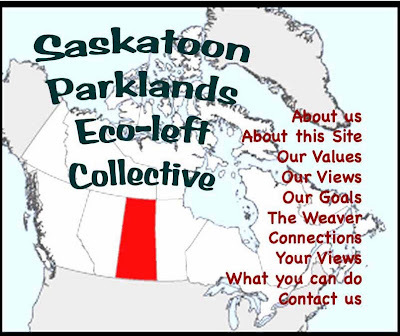 The Saskatoon Parklands Eco-left Collective, SPEC. We are a non-partisan political collective seeking to bring together the wisdom of the left and the wisdom of the earth, seeking to envision and build an ecological socialist future, and organizing primarily in the Saskatoon and central Saskatchewan region. Globally, we are loosely affiliated with the Ecosocialist International Network, a network which, in recent years, has brought together a lot of interesting eco-left and eco-socialist individuals and groups from around the planet, forming the beginnings of a more solidified ecological left movement. The website of the Ecosocialist International Network is http://www.ecosocialistnetwork.org/. While networking with like-minded people around the globe, we also recognize the need to organize locally and respond to the particular social and ecological questions confronting us in Saskatchewan in the twenty-first century. The Saskatchewan context brings with it many issues and challenges. We are responsible for mining about a quarter of the world’s uranium, contributing globally to nuclear power, nuclear waste accumulation, and both nuclear and depleted uranium weapons, (not to mention the thousands of tonnes of radioactive mine tailings left behind in northern Saskatchewan). Our coal, oil and tar sands development, meanwhile, contributes to climate change. In the Saskatoon area, people who believe in a progressive approach to education have the task of confronting the growing corporatization and nuclearization of our university. Meanwhile, we confront a range of social and economic justice issues with rising rates of poverty, and the marginalization of various social groups. 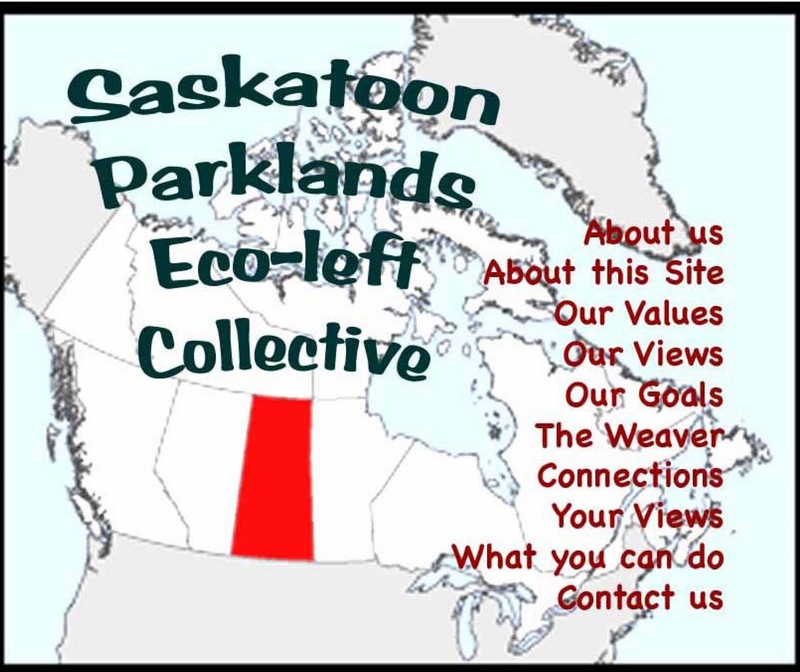 The Saskatoon Parklands Eco-left Collective seeks to address various issues in our quarterly publication, “The Weaver”, on our website, and in other advocacy contexts. At the same time, we wish to envision a radical, ecologically sound socialist alternative, beyond the limits of capitalism, militarism, nuclearism and imperialism. This entry was posted in Organizing and tagged Ecosocialism. Bookmark the permalink.